How can Arctic communities remain resilient to transforming surroundings? Can age-old resilience-thinking solutions be adapted to the Arctic today? And what does the Arctic have to teach the world about resilience? A source of inspiration for architectural movements, an ancient example of survival in extreme climates, and a renowned ability to plan and adapt to rapid shifts in surroundings mean that the indigenous populations of the North are often considered the most resilient on Earth. Being an Arctic inhabitant meant possessing resilience as an inherent skill, from gathering food and storing it over the winter months to living in testing weather. Cities of thousands of people are built in the region, and their populations are increasing. 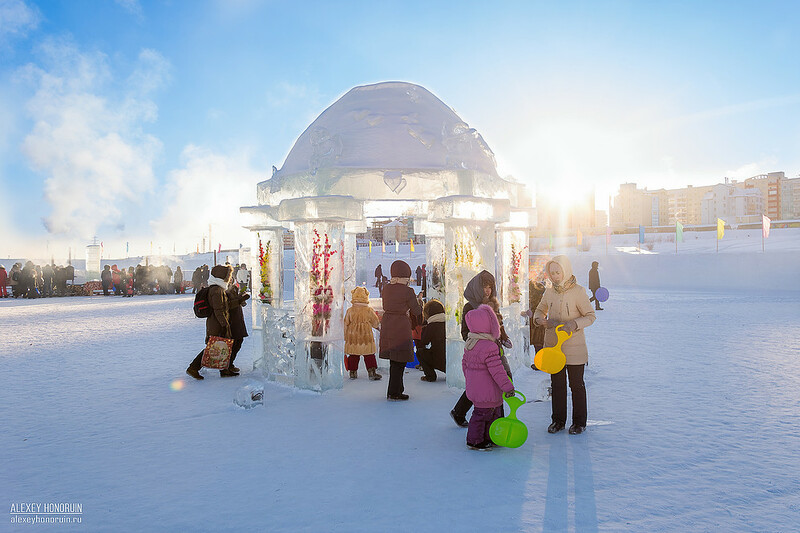 As an example, the Russian city of Yakutsk hosts an average of 320,000 inhabitants, and is expecting 80,000 more by 2032. This increase is triggered not only by people leaving the rural Arctic areas for cities, but also by people migrating from the South to the high North. The Arctic is becoming more attractive and is likely to remain so with the new economic possibilities from mineral and oil extractions, industrialization, tourism, among others. In parallel, and as a consequence, important social and economic changes are taking place which bring new challenges to the people and traditions in the region. Climate change will be the greatest threat to the existing way of life in the Arctic. Cities or villages that rely on the ecosystem must prepare for climate change before they become uninhabitable and cause forced-displacement. Changes are already manifesting themselves in northern cities such as Yakutsk, Russia, where thawing of the permafrost is resulting in buildings cracks. Resilience-thinking does not however simply mean preparing for these existing and future risks, but also seeking opportunity in them. From planning out the risks related to global warming, Arctic cities can potentially identify the opportunities related to the opening of new trade routes and if managed responsibly and with enough time to prepare, the region can capitalize on these opportunities to mitigate the negative impacts of climate change and ensuring further developments do not exacerbate the risk or bring new ones. As the Arctic Resilience report of 2016  suggests, changes in the Arctic are mainly driven by external, human factors, most notably global warming and pollution however they cannot be tackled only in the region. As populations shift to urban centres that offer new opportunities and easier access to basic services and employment, the social changes in the Arctic are equally as dramatic. The report therefore emphasizes the importance of having a holistic approach to resilience in the Arctic. The shifting challenges in the Arctic are all the more complex given the different actors that have traditionally operated in the region and those that will be attracted by new opportunities. From the private sector to traditional cultures and new urban arrivals, developing resilience in Arctic cities must give all new actors an equal voice and place at the table, while also ensuring that traditional and vulnerable groups are not pushed aside. The oil industry for example that will likely move in to many Arctic areas will bring new economic activity but with it an added risk of oil slicks, while potentially undermining an already fragile ecosystem. In addition, the social aspect of these developments ought to be considered as this traditionally male-oriented sector may impact on women, who are already leaving the region in larger number to seek better opportunities. Building resilient cities in the increasingly urban Arctic region combines the traditional challenges of living in the region with the added challenge of urbanization and the growing impact of climate change. Shaping resilience in the region is nevertheless imperative because of its importance for the global ecosystem and the immigration triggered by new opportunities. There is a community of resilience-thinkers in the region that are leading dialogue at community, regional and global level and this has triggered the suggestion of bringing together the diverse voices to one table around common resilience challenges. While many challenges in the Arctic are unique, others are common to almost all cities and Artic leaders have a valuable role to play in contributing to resilience discourse.